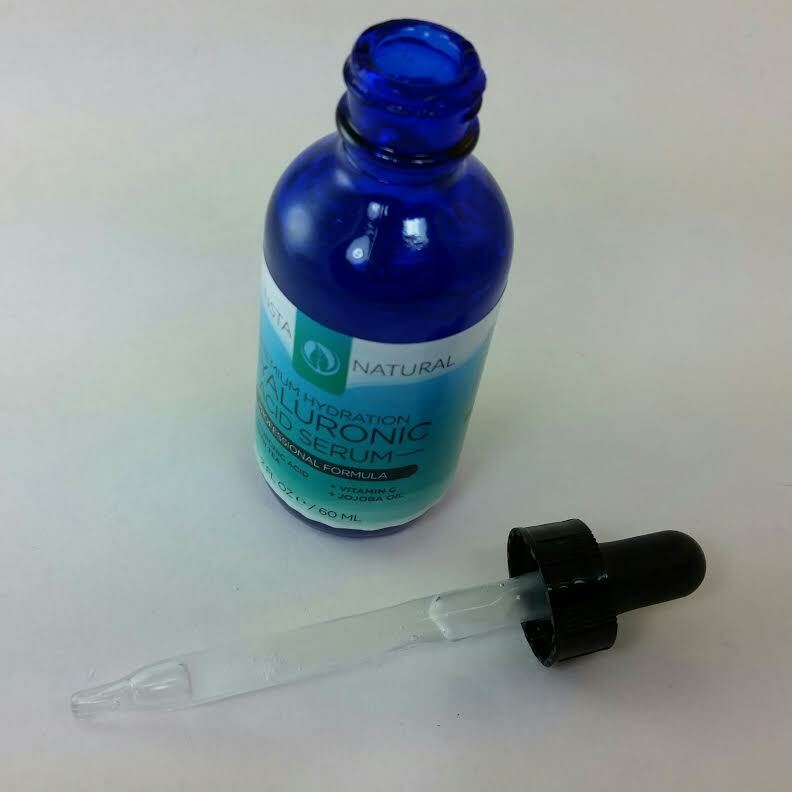 I recently received an opportunity to try a new hyaluronic acid serum. If you've read any of my posts, you know I'm a fan of hyaluronic acid so this was an irresistable offer. I received this product free of charge from InstaNatural as part of a BrandBacker campaign. Brandbacker is a website that connects bloggers with companies, giving them access to unique opportunities. While this is a complimentary product, it does not mean I won't give my true and honest opinion. Trust me, I will. I have combination skin with dry cheeks (especially in the winter) and an oily T-zone. I am not acne prone though I do get some hormonal breakouts on my chin. Which makes no sense to me but that's what it is. I just get to deal with it. I personally love serums because I find that they are the perfect consistency for my entire face. I'm also getting older and those fine lines are starting to appear. With all that said, on to the product! 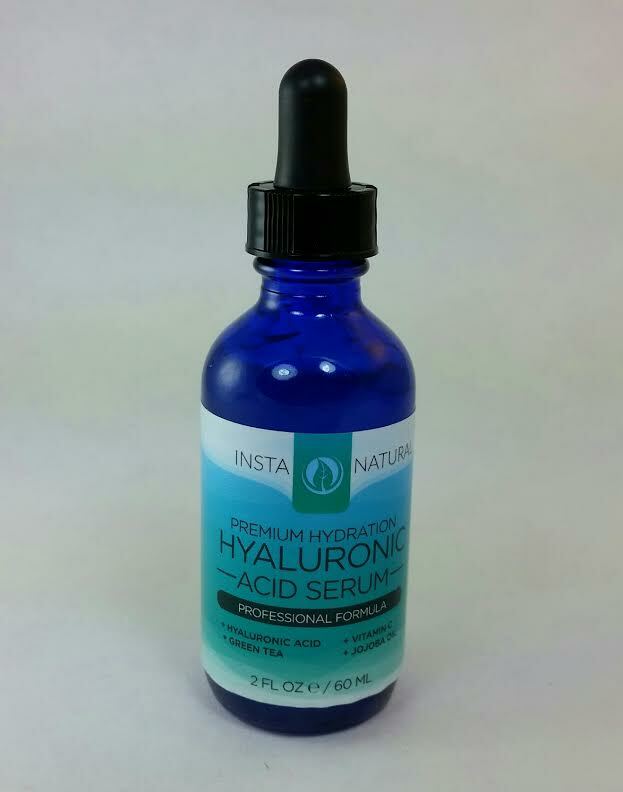 Instanatural Hyaluronic Acid serum is vegan and packed with a professional formula of anti-aging ingredients - such as Vitamin C, Green Tea, Jojoba Oil, and other antioxidants. It comes in an opaque glass bottle with an eyedropper cap. This is not a 100% Hyaluronic acid serum, nor does it claim to be. In fact it offers several enhancements over a straight hyaluronic acid serum because it contains other beneficial ingredients. One of the most effective ones being aloe. Aloe isn't just for sunburns. It's a soothing anti-inflammatory and it's anti-septic benefits are especially awesome with acne prone and troubled skin. 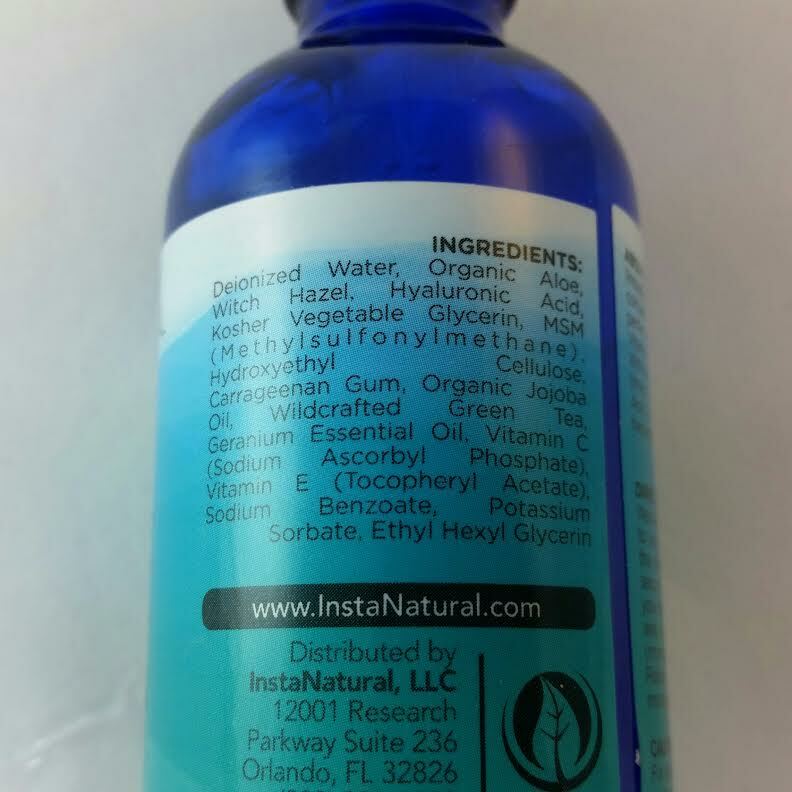 The InstaNatural serum also has glycerin in it which is an excellent moisturizer. Glycerin is a humectant and according to Paula Begoun "glycerin works because of its ability to attract water from the environment and from the lower layers of skin (dermis) increasing the amount of water in the surface layers of skin. Another aspect of glycerin’s benefit is that it is a skin-identical ingredient, meaning it is a substance found naturally in skin. In that respect it is one of the many substances in skin that help maintain the outer barrier and prevent dryness or scaling." A quick run through COSDNA shows that this is a nice and clean list. There is one possible irritant for acne prone skin and that is vitamin E. I will note that witch hazel has some excellent astringent, anti-inflammatory and antioxidant properties but some may feel that it dries out their skin. I have not noticed this and it's quite possible the hyaluronic acid and glycerine combat that but I don't know for sure. I can't give an exceptionally scientific explanation but I can say that hyaluronic acid is produced naturally in our bodies and production decreases as we age. It is able to hold 1000x it's weight in water and is extremely helpful with moisturizing. Hyaluronic acid is easily absorbed by the skin and you will see a difference in your fine lines and wrinkles. However, this is not because they are disappearing for good, it is because your skin has plumped up with moisture from the acid and filled those little wrinkles in. I'm not complaining about that either! You can't stop aging but you might as well look good while you are on the way, amirite?! One thing I have to note. This stinks. It does not smell good in the slightest. It smells VERY herbal. 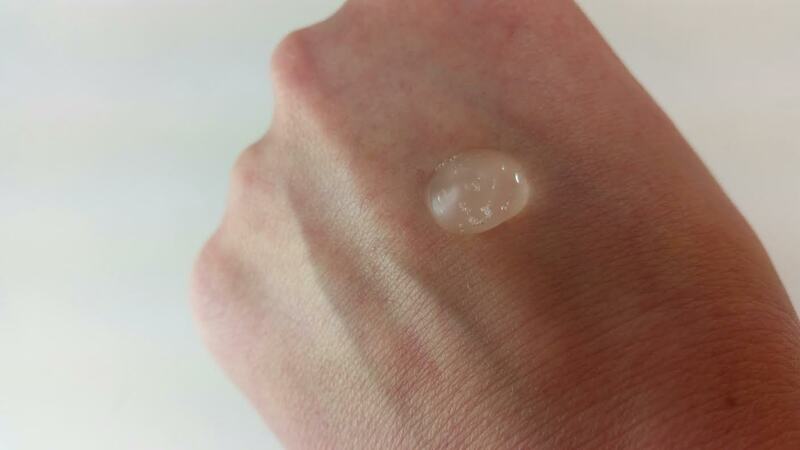 It's a clear, thick gel that smooths on lightly and sinks in with little to no stickiness. It will leave your skin SO soft. You will notice an immediate difference. I did a little experiment with my hands. I put a dropper full of serum on the back of my left hand. My left hand got the serum and the other did not. 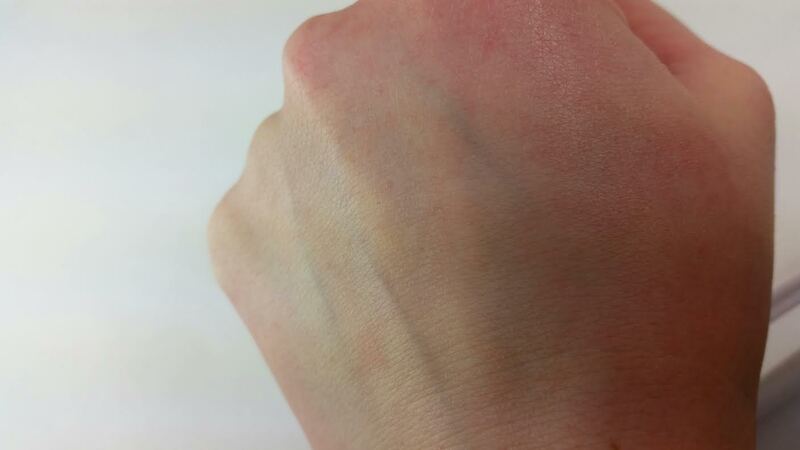 Right away, the skin on the "serum hand" smoothed out. Besides being super soft, the fine wrinkles disappeared. When I tried making wrinkles on the backs of my hand the "serum hand" made no fine wrinkles at all (it obviously made big ones because I was pressing my skin) and the non-serum hand had wrinkles galore! I'm 37. I'm no spring chicken but I'm still YEARS away from accepting the fact that I have wrinkles now. After I saw what the serum did to my hand, you bet I smeared a new layer on my face. Aside from the smell, I think I might like this more than the 100% hyaluronic acid serum I'm currently using. Mainly because of the addition of aloe. I really like products with aloe because I do find it helpful with keeping my skin happy. After 3 days of use on my face both morning and night, I can see a visible difference. I used nothing on one half of my face and ONLY the serum on the other half. For three days. My poor skin. Let me just say that there was a dramatic difference not only in the look and feel of my skin but also in wrinkle levels. My sad, unloved side visibly had more fine lines. The loved sided with the InstaNatural serum was softer, smoother and formed far fewer wrinkles. What I'm saying is... This is a very effective moisturizer and when used regularly it will keep your skin plump with fewer fine lines and wrinkles. It also will make it softer and smoother. Any effective moisturizer should do the same thing but if you're a lazy type, this serum is super easy to use and actually works. If you would like to purchase the exact serum I used for this review, you can find it on Amazon here. It's reasonably priced (my 100% version by a different brand cost $25 for less product) if you are interested in trying something like this. I'm not a beauty blogger but I do love my skincare and I wouldn't recommend something if I thought it would give you hives or cause your face to turn green and fall off. *This product was sent complimentary for review purposes. All opinions are wholly my own. Product received through Brandbacker. Affiliate link used in this post. Boxycharm January 2015 Spoilers! Think Tarte! My Favorite Things from 2014! Blind Surprise Half Off Subscription Coupon! Quarterly Rosario Dawson #18902 Review! OrangeGlad Subscriptions 45% Off!!! GREAT DEAL! Something Snacks Review and Free Box Offer! Get 20% off a One Year Birchbox Subscription! Julep FREE $50 Tieks Gift Card with ANY Purchase! Fabfitfun VIP Winter 2014 Review and Coupon Code! Winter Walmart Beauty Box Sign Ups are Open! Get Your Holiday Lip On Giveaway! Ipsy December 2014 Sneak Peek #2! Be Radiant! French Box December 2014 Giveaway! Cyber Monday Subscription Box Codes!